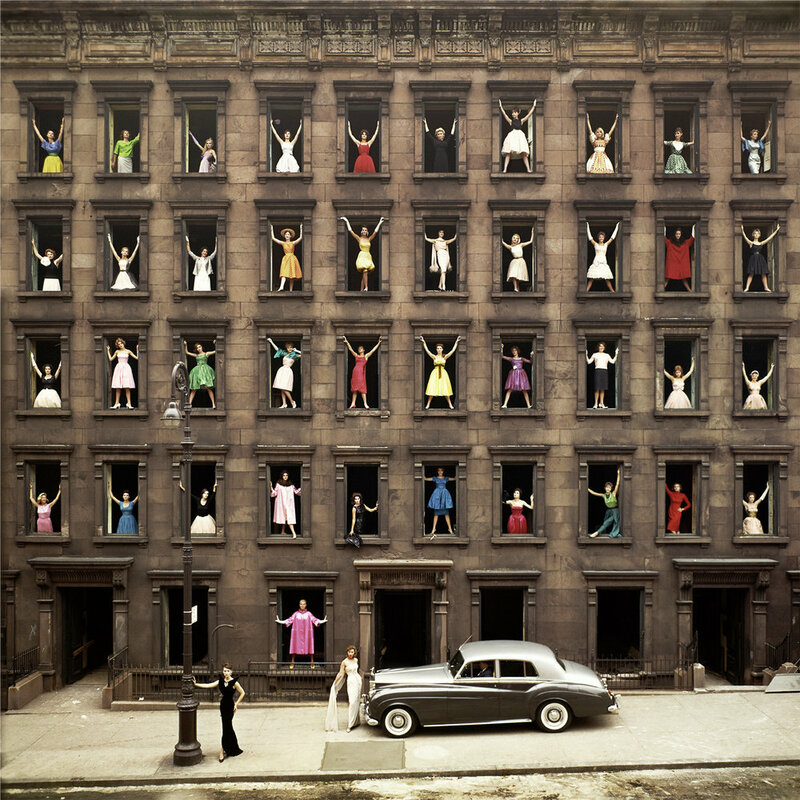 It was the summer of 1960, and one morning I glanced out of the window of my studio in Manhattan and noticed that a row of brownstones across the street were being prepared for demolition. Looking at the design of the empty windows, an idea struck me: put a woman wearing colorful clothes in each of the openings. I sent over someone from my staff to talk to the demolition supervisor. He agreed to let us go ahead – provided we use his wife in the photograph. We could shoot the next day during their lunch hour, he said. After that, the building would be gone. So, with 24 hours to pull it off, we called up all our contacts to find models and locate a Rolls-Royce to sit on the sidewalk in front. I had a good reputation, as I was working for Time and Life magazines, so it was quite easy to convince people. All of a sudden it was happening. There were models, socialites, my wife (second floor, far right), the supervisor’s wife (third floor, third from left), all wearing their best dresses. I moved them around to spread out the colors and told them to pose as if they were giving someone a kiss. As I was photographing, I noticed some of them were on the windowsills. As these were made of cement and sometimes break off, I shouted at them through a bullhorn to stay within the frames. The noon sun was overhead and the light shone between the streets. Miraculously, the police didn’t come by and stop us – and, within an hour, I’d got my shot.